You can enable turns to help guide certain games or to have more control in how turn-based games are played. Click on Options -> Turns to bring up the Turns menu. ◘ Check this box to enable Turns. When it is a player’s turn, they will hear a sound and an “End Turn” box will show up at the top of their screen. ◘ Others can see whose turn it is by noting the green star next to their name. If the player is taking too long or forgets to end their turn, the host can move turns along by clicking the green star. ◘ To turn off Turns, just go back into the Turns menu and uncheck the box. Type: You can choose from Automatic (default turns) or Custom. 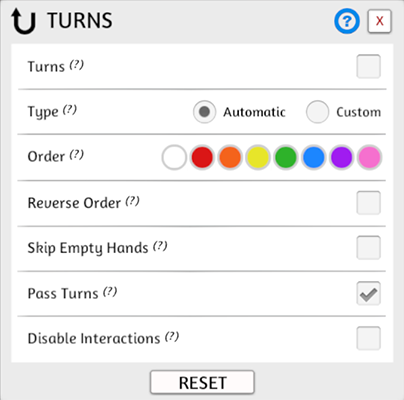 Custom lets you choose the turn order. Order: To determine the order of the turns, drag and drop the colors around in order. Only the colors that are on the table will be shown. Reverse Order: By default, turns go clockwise around the table and top to bottom on the player list. If you’d like to reverse the order of turns, check this box. Skip Empty Hand: Check this box to skip players who are seated at the table, but have nothing in their hands. It makes it easy to keep turns going when players have gone out but are still in their seats and there are only a couple people left to play. 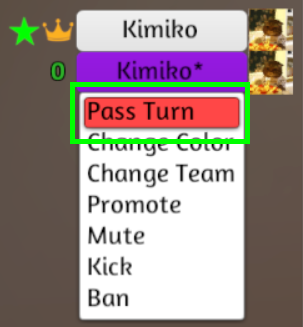 Pass Turns: Check this if you want players to be able to pass their turn to a specific color. Disable Interactions: To make your games more strict, check this option to disable interactions with objects unless it’s their turn. It’s very easy to use turns to give you a bit more control of your games.